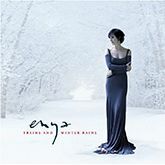 Enya: The song ‘Trains and winter rains’ is like a dark winter journey and I think everybody has taken this journey where it’s time to leave home. It’s exciting but because it is the unknown, that’s why we wanted to capture the little dark aspects in both the lyric and in the music. I think that it’s important sometimes to move on. There is a time where people get too comfort in a zone and there’s a risk factor involved but go for it. it is a piece Nicky Ryan is particularly fond of. this funky riff in it and I thought, ‘I want this.’ There is a slight darkness; it has an atmosphere which I love,” he smiles. The song premiered on the BBC Radio 2 show Wake up to Wogan on the 29 September 2008. The song features Agnus Dei, The Lamb of God, a Christian verse commonly heard in churches. The invocation to the Lamb of God is sung or recited during the fraction of the Host. ‘Trains and Winter Rains’ was the first single from the album and the only one that got a physical release and a music video. It was officially released on November 10, 2008. The music video, directed by Rob O’Connor from Stylorouge with Mikkel Lundsager Hansen co-directing, tells a story of a young boy making a journey from home. The train station scenes were filmed in Heron Quays DLR station in London. The video became available on Enya’s official website on October 22, 2008.